A quality pen at a low, affordable price point, the 3-Color Pen with Stylus is the perfect appreciation gift for a large group of people, such as all your employees. With three ink colors and a universal touch-screen compatible stylus tip, it’s the only pen they’ll ever need! The Econo Corkscrew and Bottle Opener is a complete bar and kitchen tool set with a stainless steel corkscrew, bottle opener, and foil blade. Offering the perfect backdrop for your imprint, it comes in three striking colors: bold red, sleek black, or unique semi-transparent turquoise. This classic gift alone is a great way to express your gratitude, and for someone whom you’re particularly grateful, you can pair it with their favorite wine or bubbly! This stylish, wireless charger has a secret: it’s also a Bluetooth speaker! Compact and minimalist, it fits discreetly on any desk, while packing a ton of power and volume. Ideal for office parties or at-home use, this charger and speaker combo guarantees your full-color imprint will be in the spotlight frequently! 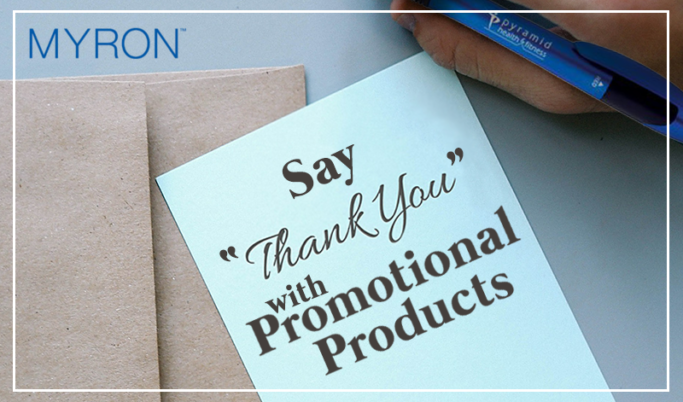 For more employee and customer appreciation gift ideas, visit the Myron blog or explore our huge catalog of promotional products. With a 100% satisfaction guarantee, Myron ensures that you receive the highest quality products at the best possible price point.